1-1/2 in. Stainless Shingle 4D Nails, Ring Shank, Hand Drive, 1 Lb. 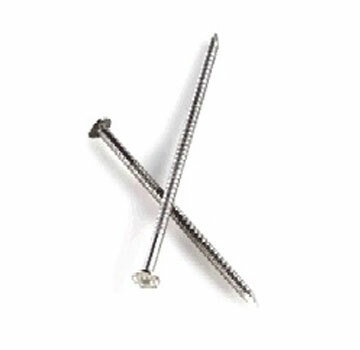 PRODUCT: 1-1/2" 304 STAINLESS STEEL HAND DRIVE 4D SHINGLE / SHAKE NAILS, RING SHANK, 14 GA x 7/32" HEAD. MADE IN USA. BULK PACK, 1-LB (about 394 nails). PRICE/LB. Annular ring thread for maximum pull-out resistance. Checkered head for slip resistance. Slender shanks to minimize wood splitting (14 gauge / 0.083" shank). Stainless Steel for extreme and corrosive climates. Available sizes: 1-1/4, 1-1/2, 1-3/4, 2, 2-1/4, 2-1/2" lengths. Packaging: 1lb, 5lb and 25 lbs boxes. Materials: Also available in 316 Stainless Steel.